The combination of apricots and vanilla will always remind me of the warm, poached apricots and saffron dessert recipe I got from a publication on Ferran Adria of elBulli — yeah, that Ferran, you know the Godfather of gastronomic cuisine in Spain. In this recipe, pure Madagascar Vanilla extract perfumes the cake with a delicate floral spiciness, while the toasted almonds lend a delicate sweetness. The soft spiced cake with jam is taken to new heights when eaten warm. Two layers of cake sandwich the fruit filling and becomes slightly gooey with the honeyed apricot jam that has hints of pineapple. The cake stores well. You can freeze in small portion sizes for a quick grab-and-go dessert. As you can see, I love delicious desserts, but I’ve been struggling with my weight on and off (but mostly on) for most of my adult life. Vi-Salus selected me to be a Latino Blogger Ambassador this spring to help create recipes using their Vi-Shape Sweet Cream Nutritional Shake Mix, in addition to drinking shakes daily. The nutrients in the Sweet Cream Shake Mix almost makes you forget about the sugar and butter in the cake. Keyword: almost. But as mentioned above, cut the cake into small portion sizes and you’ll be fine. 1. Preheat your oven to 325°F. Grease a, 8”x11” baking dish. 2. In a heat proof bowl/mug, melt the almond bark in a microwave. Set aside and allow to cool for a couple minutes. 3. Using a stand mixer, cream together the butter and sugar until light and fluffy. Add eggs one at a time, beating well after you add each egg. 5. Carefully (and on low speed) add in the Vi-Shape Sweat Cream and the flour. Mix until everything is just mixed. 6. Spread about half your batter in your prepared baking dish. Bake for 15-20 minutes or until the cake is mostly set. 7. Evenly spread your apricot jam on the cake. Spoon over the remaining batter and smooth out. Sprinkle the top of the cake with your almonds. 8. 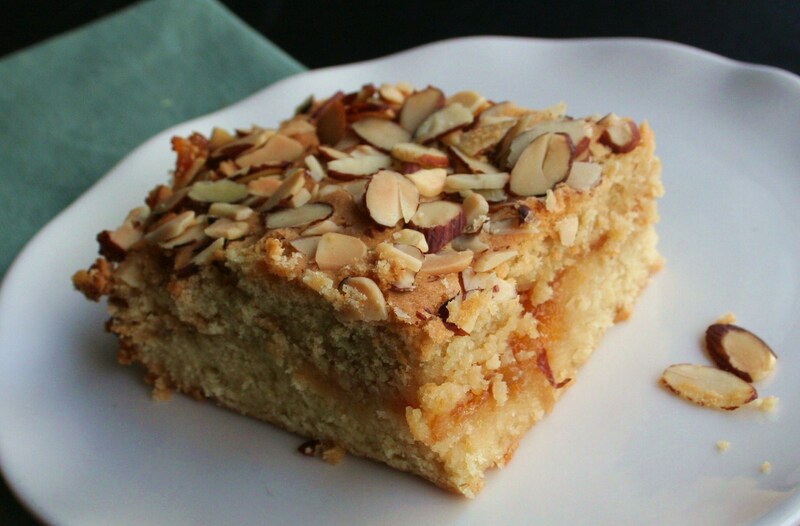 Bake for about 30 minutes, or until cake is set and looks golden brown and the almonds looked toasted. I look forward to giving this a try. I was wondering if you think there would be much of a difference using whole wheat flour or either honey or something like Tuvia? Hi Katherine, the wheat flour should not change the texture too much, and the honey substitution should be fine too, but I’ve never used Tuvia. Give it a try and let us know how it turns out. what are almond barks and is there a sustitute for it , cant i just use ground almond?? It’s basically “white chocolate.” You’ll find it in the baking aisle right by the chocolate.